In 1923, a group of young radical German thinkers and intellectuals came together to at Victoria Alle 7, Frankfurt, determined to explain the workings of the modern world. Among the most prominent members of what became the Frankfurt School were the philosophers Walter Benjamin, Theodor Adorno, Max Horkheimer, and Herbert Marcuse. Not only would they change the way we think, but also the subjects we deem worthy of intellectual investigation. Their lives, like their ideas, profoundly, sometimes tragically, reflected and shaped the shattering events of the twentieth century. 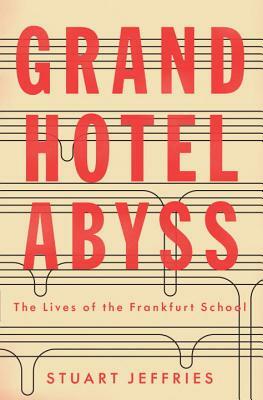 Grand Hotel Abyss combines biography, philosophy, and storytelling to reveal how the Frankfurt thinkers gathered in hopes of understanding the politics of culture during the rise of fascism. Some of them, forced to escape the horrors of Nazi Germany, later found exile in the United States. Benjamin, with his last great work—the incomplete Arcades Project—in his suitcase, was arrested in Spain and committed suicide when threatened with deportation to Nazi-occupied France. On the other side of the Atlantic, Adorno failed in his bid to become a Hollywood screenwriter, denounced jazz, and even met Charlie Chaplin in Malibu. After the war, there was a resurgence of interest in the School. From the relative comfort of sun-drenched California, Herbert Marcuse wrote the classic One Dimensional Man, which influenced the 1960s counterculture and thinkers such as Angela Davis; while in a tragic coda, Adorno died from a heart attack following confrontations with student radicals in Berlin. By taking popular culture seriously as an object of study—whether it was film, music, ideas, or consumerism—the Frankfurt School elaborated upon the nature and crisis of our mass-produced, mechanised society. Grand Hotel Abyss shows how much these ideas still tell us about our age of social media and runaway consumption. Stuart Jeffries worked for the Guardian for twenty years and has written for many media outlets including the Financial Times and Psychologies. He is based in London.